We were very surprised to find a freeware utility like Glary Utilities which did so much without having the nag the user to upgrade to a full version. Though Glary Soft *does* also sell a "Pro" version, the current freeware offered does a great job of checking your system for temporary files, registry errors, wrong paths and a very basic spyware scanner. The idea behind Glary Utilities is simple. It checks your computer for Registry Errors, Invalid Shortcuts, Dangerous Startup Programs, Temporary Files, Spyware and finally can clean up your tracks on the Internet like temporary files, cookies and history. Version 5.117.0.142 is a freeware program which does not have restrictions and it's free so it doesn't cost anything. For security reasons, you should also check out the Glary Utilities download at LO4D.com which includes virus and malware tests. Additional screenshots of this application download may be available, too. Glary Utilities has a presence on social networks. 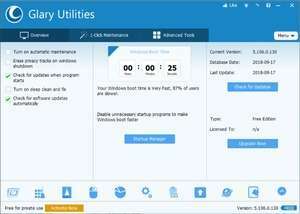 Glary Utilities download been highly rated by our users.